We all have our comfort zone. That cosy place where we feel safe and secure and nothing can hurt us. Unfortunately, in the cut throat world of business retiring into that comfort zone will do you no good whatsoever. To achieve the success we all secretly yearn we have to step out of it and grab every opportunity that comes along as who knows when the next one will arrive? 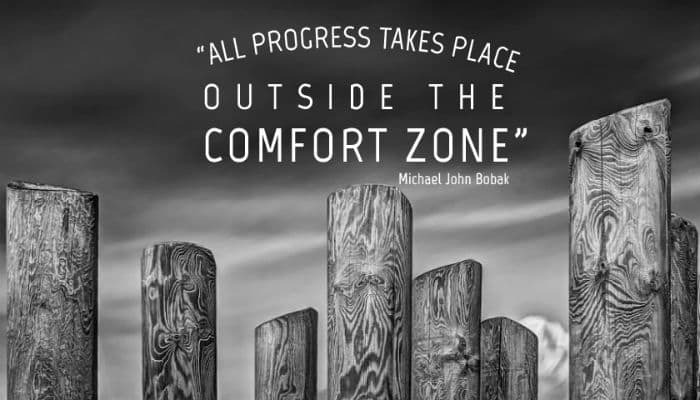 Stepping out of that zone is easier for some than others, and if you know somebody at work who needs that encouragement then you should look at sending them these great Push Yourself business ecards. The stark monochrome image on the front of the card are of planks of word, symbolic of the barriers that surround us in our comfort zone yet there are spaces between them through which we can escape. If you have a business colleague you know would make a brilliant team leader or manager then maybe it is up to you to let them know that. The text on these ecards reads; “All progress takes place outside the comfort zone”. Simple yet wise words that speak volumes and quite frankly is common sense. As you have to expand your horizons to move forward. Sending ecards is now the norm and now more common than for the Christmas holiday season. Why don’t you check out our amazing business holiday ecards?